A beautiful combo of flowers and chocolates is sure to spread its magic on your sweetheart. 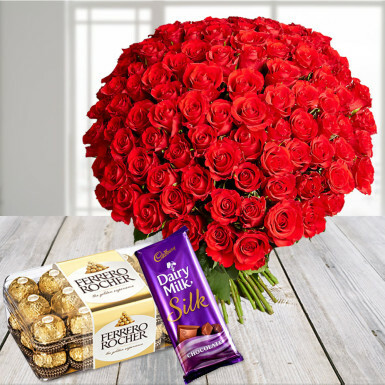 This combo consists of 100 red roses in cellophane packing, and this bouquet is complemented with a super delicious ferrero rocher and dairy milk silk chocolates. Red roses exude love and beauty. They have been the best way to tell someone that how much you love them. To express your feelings, this combo is the best choice. You can present this combo on occasions like birthday, anniversary, Valentine’s Day, rose day, propose day and many more. So, go ahead and place your order now!